Fabricated Metals manufactures a wide range of Unloading Stands for it's complete line of products. The FLO-BIN® stand illustrated above can be manufactured in different heights and for any number of bins. 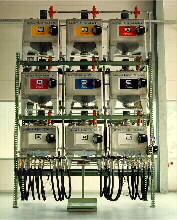 The ink dispensing system above illustrates the complexity of Unloading Systems available. Please call for custom designed systems. 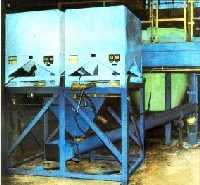 Dual FLO-BIN Unloading stand feeding into a screw conveyor.